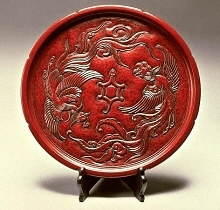 The nominal designation of Kamakura-Tsuba comes from the fact that its carving style is similar to Japanese wood engraving folkcraft "Kamakura-Bori". So, it has nothing to do with the name place "Kamakura" in Sagami Province (present Kanagawa Prefecture) and also nothing to do with the Kamakura period (1192 - 1333) of Japan. 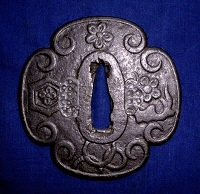 (1) Only iron plate is used as material. (2) Flowers and grass such as Kiku (=chrysanthemum) or arabesque, or castles in Chinese styles are expressed in Kamakura-Bori relief carving method. We can say that the Kamakura-Tsuba is descended from the Tosho-tsuba or the Katchushi-Tsuba. 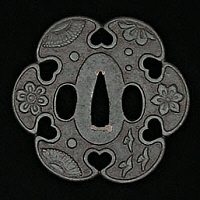 Though, most of Kamakura-Tsuba were mass-produced during the period of Civil War for fair demand of sword guards. So, basically, forging of iron plate of Kakakura-Tsuba is not done well compared to Tosho-Tsuba and Katchushi-Tusba. As a result, it's a pity that there is little luster on their surfaces even though we care for them. All and singular Kamakura-Tsuba have no inscription on their surfaces.